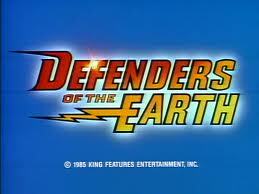 In the late 1980s, when I was a wee lad (ok, not that little but a bit younger than I am now) there was an awesome cartoon called Defenders of the Earth. It featured a number of very brightly dressed heroes that went out on exciting adventures together to battle the forces of evil, usually led by Ming the Merciless. I was previously aware of Flash Gordon, from the old black and white TV shows and then later from the seminal 1980 film starring Sam Jones, Timothy Dalton and of course the fabulous BRIAN BLESSED! You have to type his name like that in caps, because he is never ever quiet, in any interview. Then there was the Phantom, the Ghost Who Walks, who I knew from the comics created by Lee Falk. Added to that was Mandrake and Lothar, who I didn’t know plus a whole bunch of their kids, and unfortunately a weird fuzzy little alien thing, allegedly for comedy effect. Anyway, the cartoon itself was pretty awesome, as it mashed all of these characters together on screen. Long before we had The Avengers battling aliens in New York City on the big screen we had the Defenders of the Earth. We had Flash blasting stuff out of the sky with his spaceship. We had Mandrake doing all sorts of clever and cunning things with his magic and generally outwitting the enemy. We had the mysterious and slightly brooding Phantom who was a physical and yet philosophical hero and Lothar, the muscle of the team who could build anything. He kind of reminded me of Panthro from Thundercats. The others would really be lost without him as he was the backbone of the team. Together they destroyed countless armies of ice warriors, saved villages from the evil Ming and a wide array of nasty allies and fought the good fight. Normally the children in these shows are really annoying. They flap around and don’t do much, but in Defenders they were actually pretty involved, and reasonably competent. The most interesting character among them was Jedda Walker, the Phantom’s daughter. For those not familiar the Phantom is a legacy character, a seemingly eternal and ageless presence, but in fact the mantle is passed on from one generation to the next. In one episode of Defenders, the Phantom goes missing and is believed dead, and so Jedda becomes the Phantom. It might sound trivial but that kind of thing didn’t really happen a lot back then, especially not passing the mantle of a superhero from a man to a woman. I haven’t watched the episode since, and couldn’t tell you any details about it, but I still remember it today which indicates how unique it was at the time. Today we’ve currently got a female Thor at Marvel comics, but this was about 25 years ago and things were very different. The whole series came out on DVD a couple of years ago and while some of the special effects and stories might not be great by today’s standards, it’s still a fun show to watch and one you can sit down with your kids to watch and not worry about. Partly in honour of the show, and partly because I like creating things and love Lego, I’ve submitted a project to Lego Ideas which you can find out about here. Those Lego Idea that receive enough votes are submitted to Lego for consideration and those they think have legs get made into proper sets. Previously submitted Lego Ideas that have made it into the shops include Back To The Future, Ecto 1 and Ghostbusters, Lego Birds, Research Institute with scientists and an awesome Exo Suit space thing. More info on the successful projects is available here.